What If You Could Really Be Heard? What If Being Heard Led to Real Change? We’ve made great progress, but we need your input. 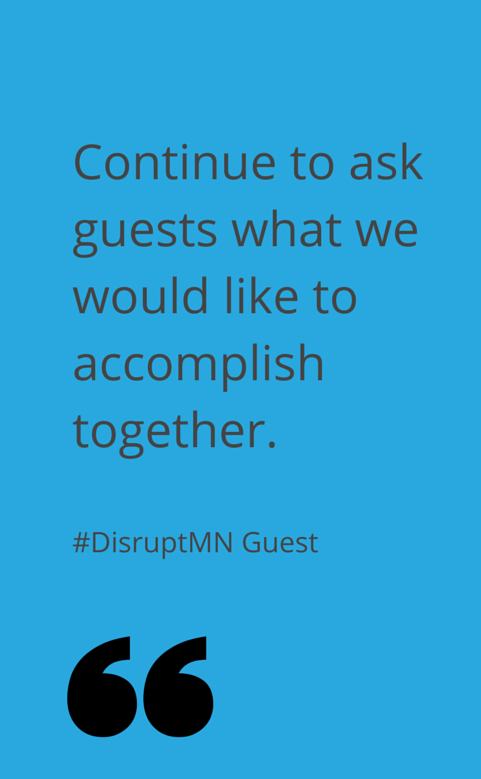 Join us on March 24 at 8:30 am for the #DisruptMN Town Hall breakfast to discuss how we can move more than 800 new ideas that reimagine giving into practice. If you are like the staff at Charities Review Council, you have a lot to say about the way giving happens, and how you’d like to make our field even better than it already is. Minnesota has long been recognized in the nation for its strong nonprofit and philanthropic infrastructure, with more than 600 organizations partnering with Charities Review Council on an Accountability Wizard review. Still, being a nonprofit leader isn’t easy, especially in Minnesota, where our community is striving to bridge some of the largest social disparities in the nation. The economic recovery is leaving behind many nonprofits and communities in need. For many nonprofits, tight budgets used to be just long enough to feed the hungry, support the arts and fight for the environment. That’s not true anymore. Since the economic downturn in 2008, nonprofits are working to ‘do more with less.’ Chronically tasked with increasing demand for services with fewer donation dollars supporting their operations, nonprofits have difficulty keeping up with demand. According to a 2014 study by Nonprofit Finance Fund, 56% of nonprofits can’t meet demand. 80% of nonprofit respondents reported an increase in demand for services, the 6th straight year of increased demand in a row (Nonprofit Finance Fund, 2014). Social sector leaders recognize that the old way is no longer working. According to Charities Review Council data, the average administrative expense of Minnesota nonprofit sector is around 11% of its total budget. That means that many organizations are shortchanging their staff compensation, technology infrastructure and other key elements of their operations. This percentage is a red flag for the nonprofit sector’s ability to sustain itself. Donors and nonprofits are calling for new, innovative ways of making ends meet. 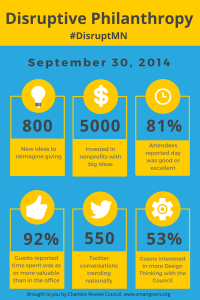 For that reason, Charities Review Council and our innovative, cross-sector and inter-generational planning team came together to re-imagine our annual event, leading to Annual Forum 2014: Disruptive Philanthropy on September 30, 2014. Our goal was to build a space and place where donors, grantmakers and nonprofits could come together to imagine, create and innovate new ways of practicing philanthropy for an even greater good. While not every part of the Annual Forum 2014 experience was perfect, we (and you, via your evaluation results!) count the day as a success. We took a risk, we tried something new, and we learned from it, after all. Hundreds of you joined together, ready to bring your best ideas to the table. One of the biggest successes of all was the morning Design Thinking session, led by Virajita Singh of the University of Minnesota’s College of Design. 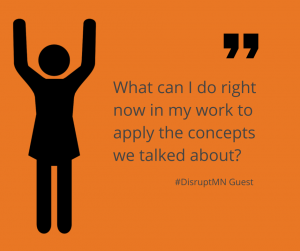 This session engaged more than 140 social sector leaders (the largest Design Thinking session in Minnesota to date!) to come up with more than 800 (!) new ideas to re-imagine giving. But ideas alone are worthless without a plan, a vision and the collaborative will to put them into place. Let’s make that plan together. Please join us for breakfast on your way to work on March 24. We’re listening. Charities Review Council asks that you come ready to share your thoughts about how we can take those fantastic ideas and put them into practice together.